Finding the “right” diet for hypothyroidism can be easier said than done. There are tons of diets that all claim to improve your thyroid health, however, they lack the science to back up their claims. And this can be dangerous, especially when many of these diets recommend foods that have been shown to negatively affect your thyroid. 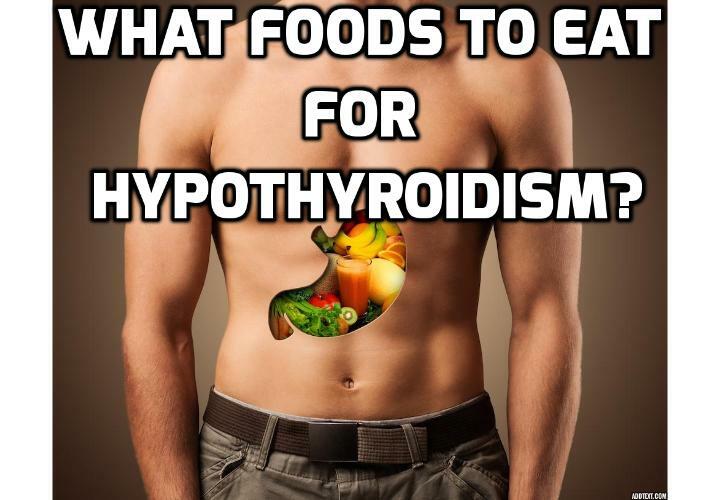 Below I have laid out some general but useful tips that you need to consider when choosing the right diet for hypothyroidism. All of these tips are based on research that accounts for the nutrients required for your body to not only produce thyroid hormone but to also to convert it and deliver it successfully to your cells where it is used. The best diet for hypothyroidism should be very anti-inflammatory by nature. And this is because inflammation from your diet or any other source, causes stress to your body and activates your body’s natural stress response. The stress hormones involved with this stress response work against your thyroid to slow you metabolism as means of telling your body to conserve energy so that it can either overcome or outlast the source of the stress. But when the stress becomes a continuous problem such as eating an inflammatory diet that places your body under daily stress then those stress hormones continuously slow your thyroid which causes many problems. Do Grains Have a Place in a Diet for Hypothyroidism? There are many sources of inflammation within your diet but one of the biggest and most common is from gluten containing grains such as wheat. And yes, all grains contain some form of gluten and in some amount. Wheat is just the one that gets the most attention. Not only that but starchy grains contain sugar chains made up entirely of glucose. And glucose alone will have a much great impact on your blood sugar than many other forms of sugar. So it’s quite common for people who eat a heavy grain based diet to have blood sugar imbalances and oftentimes develop insulin sensitivity, or diabetes. Yes, protein is good for you and it needs to be a big part of any diet for hypothyroidism. But also keep in mind that not all protein is created equal. More than a decade ago, our diet used to be quite different. We would make use of the entire animal that we ate instead of merely using a few different cuts of meat. And that included using the bones and organs as well. Fast forward to today and all we eat are a few cuts of muscle meat which tend to be far less nutritious than other parts of the animal. But more importantly, muscle meats are higher in amino acids like tryptophan, cysteine, methionine, and histadine which tend to promote inflammation. This is why I always recommend incorporating bone broths and gelatins into your diet for hypothyroidism in order to get plenty of the anti-inflammatory amino acids such as glycine. Aside from that, the anti-inflammatory proteins have a host of other benefits. They help regulate fat metabolism. They improve your clotting factors. They have even been used for more than 100 years to treat diseases such as diabetes and arthritis. Another very important component to any diet for hypothyroidism is saturated fats. The benefits of having saturated fats in your diet are enormous. But you have to break through the invalidated misinformation out there that has led so many people to wrongfully believe that saturated fats are bad. For starters, saturated fats are easily metabolized. They inhibit the release of histamine which is responsible for much the inflammation within your body. They also counteract the effects of the inflammatory proteins I mentioned above. But possibly most important to your thyroid, they promote availability of thyroid hormone receptors, allowing your cells to use T3 more efficiently. Coconut oil is one of the best saturated fats that you can eat. It’s made up almost entirely of medium chain fatty acids such as Lauric acid, which are directly converted into usable energy, instead of being stored away as fat like some would like you to believe. Butter is another great choice of fat in your diet. Butter contains plenty of nutrients such as vitamin A and vitamin D which are necessary for healthy hormone production. Another very important aspect of the best diet for hypothyroidism is that it must support healthy hormone function. And I can’t emphasize this enough. There are many different hormones within your body that all play different roles. But keep in mind that many of these hormones all interact with each other and many work to balance each other out. And when one hormone becomes out of balance then it can create a cascade of effects that effectively cause many other hormones to become imbalanced. Take your thyroid hormone as a very simple example. Your body requires thyroid hormone along with vitamin A to convert cholesterol into the cascade of protective hormones including pregnenolone, progesterone, and DHEA. But when you become hypothyroid and lack thyroid hormone then your body can’t produce enough of these protective hormones which protect your body from a number of different health issues, including cancer. And I’ll also note that when you lack the thyroid hormone to convert cholesterol, then it should make perfect sense why your cholesterol becomes elevated. And using cholesterol lowering medication to drive your cholesterol lower in the absence of thyroid hormone is not doing you any good. But by following a good diet for hypothyroidism you can effectively increase your thyroid hormone production and naturally lower your cholesterol. Selenium is one of the most important nutrients to your thyroid and the best diet for hypothyroidism will make sure that you eat plenty of foods that are high in selenium. This nutrient is so important because it’s used readily by your liver to convert your non-active form of thyroid hormone to the active form that can be used by your cells. And if you don’t have enough selenium then you quickly become hypothyroid. The most notable foods that are rich in selenium as well as other thyroid supportive nutrients is seafood such as shrimp, muscles, crab, etc. As I mentioned above, vitamin A plays a very important role in your hormone production. And it also plays an important role with your thyroid function. Too little vitamin A will suppress your thyroid, making you hypothyroid. But too much will also do the same when it’s not properly balanced with thyroid hormone. So it’s important to make sure that your diet for hypothyroidism allows you enough vitamin A to not only promote healthy thyroid function but to also ensure that your body is capable of producing the necessary protective hormones to keep your thyroid healthy. Vitamin E plays a little bit of a different role when it comes to supporting your thyroid. There are many foods that should be excluded from your hypothyroidism diet because they tend to directly affect your thyroid function. One example of a food that will negatively affect your thyroid and should not be allowed as part of your diet for hypothyroidism is polyunsaturated fats. These fats work to suppress your thyroid and block the use of thyroid hormone by your cells. And vitamin E is one nutrient that can really help offset the anti-thyroid effects of polyunsaturated fats. But it also does much more than that. It also helps balance the negative effects of estrogen which also works against your thyroid. It is anti-inflammatory, prevents the degeneration of organ and muscle tissue, and is a proven factor for preventing heart disease and miscarriages. A good hypothyroid diet doesn’t have to be overly complicated. It just has to naturally support your body’s needs so that it can produce and utilize its thyroid hormone effectively and efficiently. And it should go without saying but it’s a necessary component of any good treatment for hypothyroidism. The healthy functioning of your thyroid is essential for life. The healthier your thyroid, the longer and healthier life you will live. So regardless of whether or not you are experiencing any major symptoms of hypothyroidism, I cannot emphasize enough the importance of eating the right diet for hypothyroidism to not only reverse the various health problems you might have but to also ensure that you live a happy and healthy life. Tom Brimeyer – The author of Hypothyroidism Revolution – is a practitioner of functional medicine, health researcher and author on nutrition, hormones and hypothyroidism. His personal mission is to inspire and educate people to take control and achieve true health by correcting their hypothyroidism and underlying causes of their health problems instead of being stuck relying on doctors and drugs that merely cover up their symptoms while their health continues to suffer.